Michael Slackman of the New York Times pens a nice piece about public spaces in Cairo. Cairo is a city with a lot of people, a lot of tightly packed houses and buildings, a lot of traffic — and very little open space. There are some parks, but they tend to be fenced off and charge admission. So Egyptians grab what public space there is and make it their own. Bridges are a favorite, but nearly any open space will do. Even a patch of grass in the middle of a traffic circle. At night the Nile goes black, the murky waters providing the only chance for residents of this crowded city to stare into wide open space, offering a spiritual tonic for those whose lives are defined by the harsh borders, small apartments, low pay and little opportunity. “I feel suffocated, of course,” said Nourelhoda Mohammed, 18, as she described her life in Waraq, a poor, crowded neighborhood. She has graduated from high school but has no job and is hoping to marry. She passes the time on the Rhode al-Farag Bridge, an imposing span of concrete, traffic and picnickers on the northern end of the city. “This is a place where there are not a lot of people and you can breathe,” she said. Ms. Mohammed dressed up for the outing, wrapping her head in a gold and red head scarf and applying a flowery perfume. We covered the creation and revitalization of the Al Azhar Park. The article raises the question: in a city as dense as Cairo, how can public space be provided that can improve quality of life and generally make the city a more pleasurable place? It is great to see the resiliency of the human spirit to overcome even the most challenging of spaces. 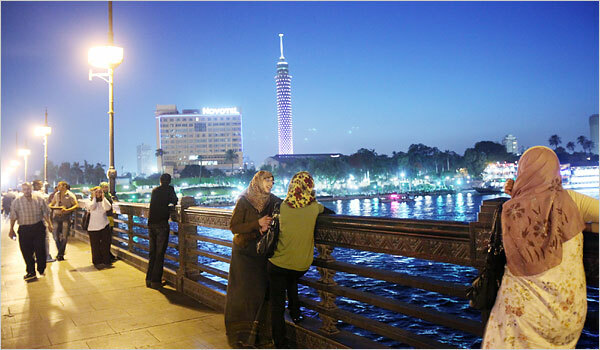 Good job, Cairo, maybe there can even be talk of a bridge closure once a week. Might get even more people to the riverfront.